Yes, you read it right. Ice Skating in Manila! You are probably thinking about where the hell are the Filipinos ice skates? Let me tell you about it, Philippines is a tropical country, geographically situated under the Equator and just like any other South East Asian countries you would not need a heater here but rather air conditioning machines. 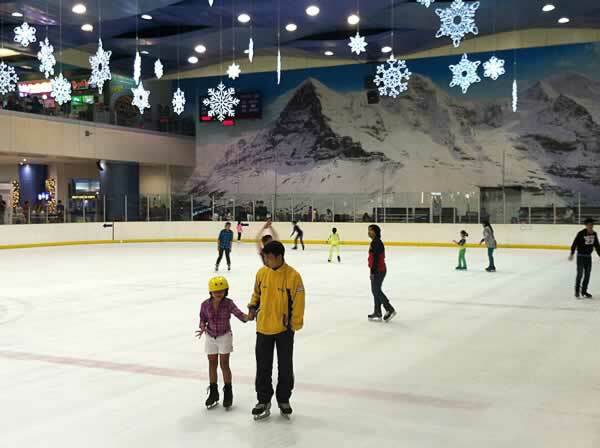 We do have ice skating rinks in Manila located in Megamall and Mall of Asia. I remember trying it years ago and did not make it because I quit after my first fall, and now that Krabi changed me, the story was changed too. April 24, 2010 as it is obviously written on the photo, Leizel, Nick, and me decided to hang out at the Mall of Asia and just “chill’ax” ice skating. It was cool costing us Php 390/each ($9 USD) for unlimited hour until they close and Php 30 locker fee which the four of us shared. Nobody knows how to skates but Nick, so he became our skating instructor. Leizel said “We’ll be a pro after this experience!” because we started around 3pm (they close at 8pm) thinking how much time we have to learn it. It was funny being back on ice again, I love water in whatever form it may be; may it be ice, snow, waterfall, beach, swimming pool, name it! So it brought me back in time when I was in Milan, Christmas season when local government sets up ice skating rink at the Duomo plaza (I was a chicken not trying it by any chance). Wake up! How I Learn Ice Skating? Nick was patient enough being forced to teach me and Leizel how to Ice Skates. I was at the side holding the wall trying to balance and get used to Nick’s basic steps on how to ice skates. I don’t remember how many rounds I did and begun to let go to skates without depending on the side of the rink. It felt really good letting go and just gliding my way to wherever I want to go but then approaching the other end of the rink, I remember I didn’t know how to control it yet and panicked, BAM! My first fall. Stood up and waited until Nick was near, asked him how to slow down, speed it up, turn left or right, and stop. I took note of what he said and tried not to fall again (although I think I fell more than 5 times having my hands look like man’s hand swelling). Few minutes later, me, Leizel, and Nick were chasing one another to put some fake snow on one’s back. Geez, that was cold. Yet, it was fun and useful for me because I think that pushed me harder to learn more how to skates better to run away from the two of them! That was awesome!